For years, Houston fans heard they needed to trust the process of their front office's extensive rebuild. On Nov. 1, they saw why. One of baseball's elite Minor League systems for the last half decade produced the biggest contributors of a historic season, a cast of homegrown stars like Jose Altuve, George Springer, Carlos Correa and Alex Bregman leading the way to the franchise's first World Series title. Hoping to following in their footsteps is the next generation of Astros. Featuring impressive depth at the Triple-A level that included 2017 Minor League home run leader A.J. Reed, outfielder Derek Fisher and more, Houston's still-formidable farm also boasts two of the game's top young prospects in pitcher Forrest Whitley and outfielder Kyle Tucker. After losing at least 106 games each year from 2011-13, the Astros saw their highly scrutinized reconstuction pay the biggest dividends and, unlike other systems that have been diluted to acquire talent at the Major League level, Houston's remains stocked with potential Major League contributors. Catcher -- Chuckie Robinson, Quad Cities (108 games): Although he was a New York-Penn League All-Star in his 2016 debut season, Robinson flew under the radar, opening this year as Quad Cities' No. 2 catcher behind Jake Rogers. Following Rogers' promotion, Robinson took over. The 2016 21st-round pick out of Southern Miss batted .274/.330/.463 with 15 homers and 77 RBIs, threw out 41 percent of potential basestealers and starred in the River Bandits' run to the Midwest League championship. "He's always been that guy that's the second-tier guy," Quad Cities manager Russ Steinhorn said. "He's always waited behind somebody and always waited for his opportunity, and whenever you give Chuckie the opportunity -- with the way his makeup is, he's a true leader -- he's just going to take advantage of it. He's never going to get down on himself. He's never going to ask, 'Why me? Why am I not getting a shot?' He's just going to continue to do the work. And when he gets in there, he's going to go in, play as hard as he can and try to prove everybody wrong, to show them that he is the guy." First baseman -- A.J. Reed, Fresno (127 games), Houston (2 games): Reed may not have done it at the big league level, but the slugger put together another impressive season at Houston's top Minor League stop. After playing 45 games in the big leagues a year ago, Reed spent all but a couple this season in Fresno due to Houston's acquisition of Yuli Gurriel. In the Pacific Coast League, Reed didn't slack off. The University of Kentucky product became the first player to win two Joe Bauman Home Run Awards as the Minors' long ball leader, matching his feat from 2015 with 34 blasts -- a Grizzlies franchise record. In 127 games with Fresno, Reed batted .261/.358/.525 with 104 RBIs. Second baseman -- Tony Kemp, Fresno (118 games): Kemp has been so good for so long in the Astros system, it's easy to forget he was only 25 for all of the 2017 season. The 2013 fifth-round selection led the PCL with 166 hits and finished fifth with a .329 average. In four full Minor League seasons, Kemp has never batted lower than .306, and his 10 homers this year were a career best. Third baseman -- J.D. Davis, Corpus Christi (87 games), Fresno (16 games), Houston (24 games): The 2017 season didn't open the way Davis may have thought it was going to. "We left Spring Training with a plan, and he was upbeat," Double-A Corpus Christi manager Rodney Linares said. "After hitting 20-something homers in Double-A and then having to repeat, it was kind of a shocker, but that's just the way our farm system is so stacked. We kind of leveled it down to having him get plenty of at-bats and work on stuff. He went down there and didn't disappoint." A year after batting .279 with an .850 OPS in 87 games with the Hooks, Davis didn't slow down in his return to the Texas League, improving his offensive production and diversifying himself in the field. In 103 Minor League games, the 24-year-old hit .282/.345/.527 with 26 homers and 78 RBIs before playing 24 contests with the big club. "He came in every day and worked hard refining his approach and making sure that he didn't go away," Linares said. "He didn't disappoint. He was as good as advertised. His defense got a lot better, and we started working him out in the outfield just to give him a little bit more options. He's a big league-ready bat. He still needs some work defensively, but he showed in the big leagues that he can hang up there." Shortstop -- Jonathan Arauz, Tri-City (33 games), Quad Cities (36 games): The Astros weren't brimming with breakout years among shortstops, but young Arauz climbed to full-season ball at 19 in his first year above the Rookie level. In 33 games with Class A Short Season Tri-City, the Panamian batted .264/.341/.704 before a 36-game stay in Quad Cities. Outfielders -- Kyle Tucker, Buies Creek (48 games), Corpus Christi (72 games): In a system that has produced some of baseball's best players in recent years, Tucker may be next. "I've always said he's got kind of an unorthodox swing and approach, but he's got good bat-to-ball skills and power," Linares said. "This kid's got an opportunity to be a .300 hitter with 30-plus homers in the big leagues. He's so young, people don't get it. He's so young, and he went through some struggles in Double-A after we sent some guys up. Losing J.D. [Davis], losing some of these guys, he was pitched a little bit different, but he made adjustments and finished off strong." Tucker handled Class A Advanced at the age of 20, batting .288/.379/.554 to make the jump to Double-A. There, he held his own with a .265/.325/.512 line as one of the Texas League's youngest everyday players. And as with all young players with high ceilings, Tucker has room for growth. "If there was a knock on Tuck, I would say defensively he still needs a lot of work," Linares said. "He's got a pretty good arm and is accurate, but he tends to want to overuse it way too much. He throws high a lot, but this kid's got a chance to be a game-changer." Derek Fisher, Fresno (84 games), Houston (53 games): When looking back on 2017, Fisher may be best remembered for scoring the winning run on Alex Bregman's walk-off single in Game 5 of the World Series. That moment came after he spent nearly one-third of the season in the big leagues after proving his readiness with a strong 84-game stint in Triple-A. The 24-year-old's .318/.384/.583 slash line, 21 homers and 76 RBIs earned his first call to Houston in June. Ronnie Dawson, Quad Cities (116 games), Buies Creek (13 games): Taken in the second round of last year's Draft out of Ohio State, Dawson got better as the season progressed. Entering play on June 1, he was batting .213/.295/.343. By the time he jumped to the Carolina League on Aug. 22, that line had climbed to .272/.362/.438. "He was always one of the first guys in the cages and one of the last guys to leave," Steinhorn said. "Even when he was struggling, he was focusing on swinging at good pitches and just trying to drive the baseball. He always showed signs of brightness and driving the ball well, and he just never really got down on himself. He kept working hard, trying to get better every day, and all those results started to come together. He got hot in the second half and got that promotion, which was very deserving." Utility -- Tyler White, Fresno (111 games), Houston (22 games): After primarily manning the corner infield spots for the first four years of his career, White was all over the defensive map in 2017. The 27-year-old played every infield position and saw time in left field for Fresno, all while compiling a .300/.371/.528 line with a career-high 25 homers and 89 RBIs in 111 Triple-A games. A year ago, White batted .217/.286/.378 in 85 big league games but held his own in his return to that level, hitting .279/.328/.525 in 22 games with Houston. 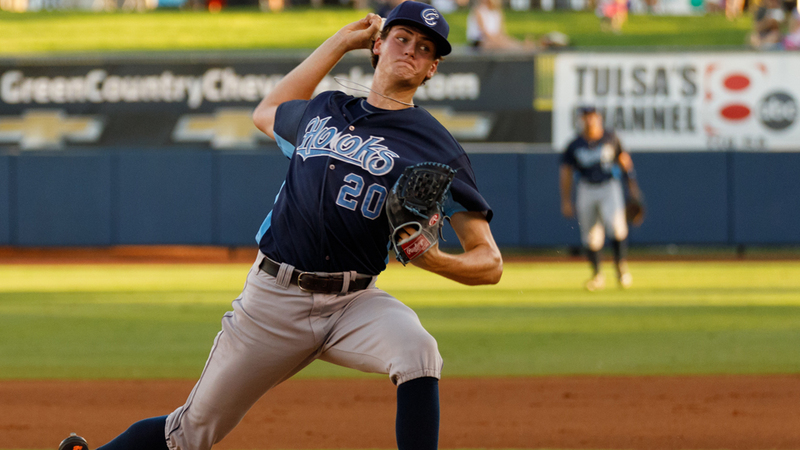 Right-handed starter -- Forrest Whitley, Quad Cities (12 games, 10 starts), Buies Creek (7 games, 6 starts), Corpus Christi (4 games, 2 starts): Like Tucker among position players, any discussion of Astros pitching prospects begins and ends with Whitley, who posted a 2.83 ERA and 1.21 WHIP with an eye-popping 143 strikeouts over 92 1/3 innings across three levels. "Let me put it this way: he's probably better than advertised," said Linares, whose Hooks' welcomed Whitley for the close of the season. "A kid with his potential, he not only looks the part, he's got a plus fastball, great changeup, developing breaking ball, and the sky's the limit for the kid. He's also a durable kid. He didn't have any issues all year and he's so young it's hard for me to say [definitively], but he's got all the makings of a future ace. We've got some good guys up there that are going to help him develop, and I think he's going to continue in the big leagues in the near future." Steinhorn, who managed Whitley at the start of the year, echoed those sentiments. "All of his pitches are plus pitches; they're Major League-ready," he said. "He never stopped learning. If he'd have a good outing, he'd always take time to go over some things with our pitching coach and look at video and the information available to him, just always wanting to get better. The guy is so focused on being the best that he can be. To see that out of a kid that is so young with the stuff that he has, I just think the sky is the limit for him, and I think we're going to see him in the big leagues sooner than most people expect." Left-handed starter -- Kit Scheetz, GCL Astros (2 games), Tri-City (6 games, 4 starts), Quad Cities (4 games, 3 starts): Scheetz may seem like a surprise selection for Organization All-Star accolades, but surprising is just what his debut season likely was to many observers. Undrafted out of Virginia Tech, the southpaw signed with the Astros on June 23, reported to the Rookie-level Gulf Coasts League two days later, and was promoted twice by the end of the year. All told, the 23-year-old went 2-3 with a 1.72 ERA in 12 games, striking out 53 while walking nine and registering a 1.02 WHIP over 47 innings. Relief pitcher -- Salvador Montano, Quad Cities (36 games): Although he didn't start the season in Quad Cities, Montano became one of the River Bandits' most reliable contributors. The right-hander worked in 36 games, converted five of six save chances, posted a 2.89 ERA and fanned 68 over 53 innings. "The work that he did in extended [spring training] with the pitching coaches down there, trying to fine-tune his mechanics and his delivery, when he came up to us, he looked a lot more confident than he had in years past," Steinhorn said. "He was more consistent with his mechanics and his delivery, and he started throwing his pitches with more intent. Everything started coming together for him."